Ahmed Chataev. Photo via MINA. Following Tuesday’s horrific attack at Istanbul’s Ataturk airport, which resulted in 44 death at the hands of three suicide bombers, Turkey was quick to blame the Islamic State for the terrorist act. And while that may be accurate, something surprising has emerged about the alleged ringleader of the group of three men who have been since identified as Russian, Uzbek and Kyrgyz nationals. As Russia’s Kommersant and Turkish media report, a Chechen national suspected of being the mastermind behind the deadly Istanbul airport terrorist attack, had previously received refugee status in Austria, which helped him to repeatedly avoid extradition to Russia on terror charges. As the complete picture of the latest terrorist attack in Turkey comes together, it has emerged that the attack was allegedly organized by Ahmed Chataev, a Russian citizen of Chechen origin, who joined the Islamic State in 2015 and now fights in Syria, Turkish media report, citing police sources. It has been also revealed that Chataev was long wanted by the Russian authorities for terrorism-related offenses but he fled to Europe, where he was granted asylum, and successfully managed to escape extradition to Russia. The alleged mastermind joined Islamist secessionist militants that fought against Russia in the Second Chechen War between 1999 and 2000, where he lost an arm. Later, he was considered to be a representative of Dokka Umarov, once a “terrorist #1” in Russia, but protected in Western Europe. The attack coordinator was on a wanted list in Russia since 2003 for sponsoring terrorism, recruiting extremists and membership in a terrorist group, Russian media report. However, in the same year, he received asylum in Austria. Chataev reportedly claimed that he lost his arm as he was severely tortured in Russian prison adding that he is being persecuted by Russian authorities. In 2008, he was detained with some other Chechen nationals in the Swedish town of Trelleborg as police found Kalashnikov assault rifles, explosives and ammunition in his car. As a result, he spent more than a year in Swedish prison. 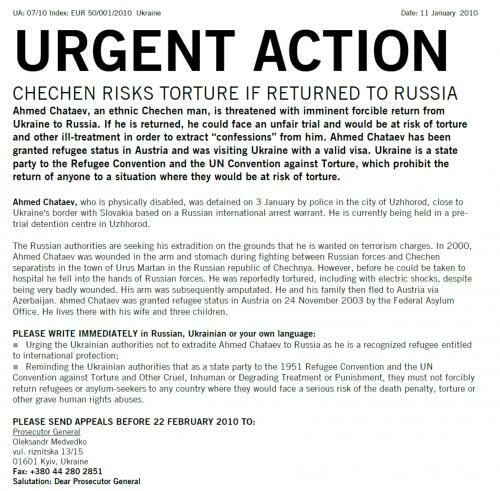 Below is the actual statement filed by Amnesty International titled “Ukraine: Chechen risks torture if returned to Russia”. One year later, he was again detained as he was crossing the border between Turkey and Bulgaria but he again avoided extradition because of the interference of human rights organizations that stressed Chataev had a refugee status in Austria and thus cannot be sent to Russia, Kommersant reported. Between 2012 and 2015, Chataev reportedly lived in Georgia, where he also joined some terrorist groups and served a prison sentence on terrorism-related charges. In February 2015, he left Georgia for Syria, where he joined IS militants and soon took a high position in the Islamic State hierarchy. Finally, in October 2015, the Office of Foreign Assets Control (OFAC) of the US Department of the Treasury added Chataev to its terrorist list because of his alleged involvement into recruitment of extremists. And just like that, in the span of 5 years, a person whose extradition to Russia was prevented by Europe and Amnesty ended up a formally recognized terrorist by the US, and ultimately his actions resulted in the death of 44 people. If only there was less political bickering between Russia and Europe, more than 40 innocent lives could have been spared. Finally, in light of these revelations, one wonders precisely what is the function of the ubiquitous NSA in today’s world?